BlendRenderer allows you to easily identify the predominant attribute among two or more competing attributes of a feature and visualizes the strength of that predominance using blended colors. Each attribute is assigned a unique color. The color's opacity is calculated for each feature based on the value of that attribute for the given feature. The higher the attribute value, the more dominant the color. 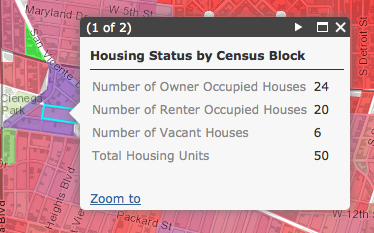 For example, let's say you want to map housing patterns in a given area based on U.S. Census data. There are three competing variables you would like to visualize: owner-occupied homes, renter-occupied homes, and vacant homes. When using BlendRenderer to visualize the layer, each of these variables will be assigned a different color. Features that are clearly shaded with one of the colors indicate an area where that attribute dominates the other two. When any two attributes (or all three) are equal, a blend of those colors will shade the feature. In the image below, the blue features represent areas that predominantly contain owner-occupied housing while the red features are mostly composed of renter-occupied housing units. Areas shaded with a light purple color, however, are composed of a near-even mix of owner-occupied and renter-occupied housing units. Thus areas with a high occurrence of one attribute will be rendered with strong opposing colors (in this case blue or red) while areas with nearly equal occurrences of the opposing attributes will blend the opposing colors (in this case purple). 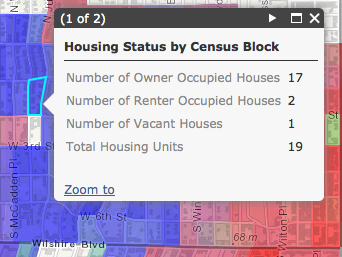 In the feature highlighted in the screenshot below, 17 out of the 19 housing units are owner occupied, therefore resulting in a strong blue color. By contrast, the area represented by the feature highlighted in the following screenshot contains 24 owner-occupied houses and 20 renter-occupied housing units. Since these two values are nearly equal, the feature is shaded with a blend of blue and red (purple). More information on working with rendering, smart mapping, and using visual variables can be found in the Data Visualization guide topic and the multiple samples referenced within this topic. Not currently supported with legends, printing, or the ability to serialize a renderer as Json. Does not work in IE8 or earlier versions. new BlendRenderer(params?) Creates a new BlendRenderer object. blendMode String This determines how colors are blended together. fields Object An array of objects to blend containing the field name and color to use. normalizationField String The field to normalize. opacityStops Object An array of objects which determines opacity. symbol Symbol The BlendRenderer applies to the color of the symbol. setBlendMode(blendMode) None Sets the mode that determines how colors are blended together. setFields(fields) None Sets an array of objects to blend containing the field name and color to use. setNormalizationField(field) None Sets the field to normalize. setOpacityStops(opacityStops) None Sets an array of objects which determines opacity. setSymbol(symbol) None Sets the symbol to blend. Creates a new BlendRenderer object. <Object> params Optional Required and optional parameters. See params list. <String> blendMode Optional This determines how colors are blended together. For a list of possible valuses and additional information on this, please refer to the CanvasRenderingContext2D.globalCompositeOperation documentation. The default value is source-over. <Object> fields Required An array of objects to blend containing the field name and color to use. See the object specifications table below for the structure of the fields object. <String> normalizationField Optional The field to normalize. <Object> opacityStops Required An array of objects which determines opacity. At least two stops are required. See the object specifications table below for the structure of the opacityStops object. <Color> color Required The color to use. This should not have a defined opacity, rather it should be a full color. <String> field Required The required field. <Number> opacity Required Opacity value, must be a number ranging from 0.0 to 1.0. <Number> value Required The data value in which to set opacity. This determines how colors are blended together. For additional information on this, please refer to this MDN article as it contains a list of various options to use. An array of objects to blend containing the field name and color to use. The color should not have a defined opacity, but rather a full color. An array of objects which determines opacity. The opacity is set based on the data. This follows a bounded continuous pattern established with colorInfo, sizeInfo, and OpacityInfo. It applies to all fields equally. Sets the mode that determines how colors are blended together. <String> blendMode Required The blend mode used to determine how colors are blended together. For additional information on this, please refer to the CanvasRenderingContext2D.globalCompositeOperation documentation. Sets an array of objects to blend containing the field name and color to use. The color should not have a defined opacity, but rather a full color. <Object> fields Required An array of objects to blend containing the field name and color to use. The color should not have a defined opacity, but rather a full color. <String> field Required The field to normalize. Sets an array of objects which determines opacity. The opacity is set based on the data. <Object> opacityStops Required Sets an array of objects which determines opacity. The opacity is set based on the data. This follows a bounded continuous pattern established with colorInfo, sizeInfo, and OpacityInfo. It applies to all fields equally. Sets the symbol to blend. <Symbol> symbol Required The symbol to blend.